River Terrace vil sove 6 personer i 3 soverom. Soverommene er i første etasje med stue og kjøkken i øverste etasje. Det største soverommet har en king size skinn seng med nattbord skap, garderobe og brystet av trekker. Dette rommet har også de ekstra fordelene ved utsikt over havnen og elven Ouse. Soverom 2 og 3 har doble skinnsenger med nattbordskap, garderobe og brystkasse. Soverom 2 har utsikt over marinaen og elven Ouse. på badet er også i første etasje med stor nedbør dusj, toalett og håndvask. Salongen, spisestue og kjøkken ligger i øverste etasje. Salongen har den ekstra fordelen av utsikt over havnen og elven Ouse. Med dører som fører ut til en stor balkong med rottingmøbler, gjør full nytte av utsikten. Hvorfor ikke slappe av og slappe av med et glass vin eller mate endene eller fisk og nyter solskinnet. Salongen har en stor hjørnesofa med eik og glass bord og stoler. Det er en LED smart TV og Virgin Media-tilkobling. Kjøkkenet er også i denne etasjen med elektrisk ovn og kokeplater. Det er også en vaskemaskin / tørketrommel, mikrobølgeovn, oppvaskmaskin, kjøleskap med fryser, vannkoker og brødrister. Det er rikelig med kjøkkenskap og arbeidsrom. River Terrace kommer også med de ekstra fordelene med Virgin Media Fiber Broadband og TV og en tildelt parkeringsplass. Ingen parkering tillatt på kjørebanen foran huset. Parkering er på parkeringsplassen. Vår parkeringsplass ligger til høyre når du går inn på parkeringsplassen og nummereres 38. Great owner who was very accommodating will return. Many thanks for taking the time to provide us with a review. Hope to see you and your family again sometime in the future. This little piece of heaven is perfectly situated just off Market Square in St. Neot's. The apartment is very, very quiet and quite well appointed. The kitchen was comfortably equipped for full evening meals. I never found myself saying "oh, we don't have one of those" when I was cooking. We stayed for 8 nights and wished we could have stayed longer! Paul and Fleur are very welcoming hosts and take excellent care of their guests and the property. Highly recommend! Many thanks for taking the time to review River Terrace. We are delighted you enjoyed your stay with us and thank you for looking after the house. We hope to see you again sometime in the future. Booked in a rush but we struck gold! We had a lovely time at River Terrace, only one day did it pour down so we went to the cinema which is maybe a 10 minute walk away. Really sunny the rest of the time. There is a Waitrose in the town and not too far away to get supplies. The fridge had new bread and jams, also butter, juice and some rolls and an egg. The kitchen is very well stocked although I couldn't find an egg cup, maybe someone broke it and not told Fleur? I managed with a small measuring cup for my boiled egg. The front door handle failed while we were there (just reached the end of its life) but one call to Fleur and it was dealt with immediately. Very happy and would stay again. Many thanks for taking the time to provide us with a review on River Terrace. Sorry about the egg cups. There should have been a set in the house but we will check and replace. Thanks for letting us know. We are really glad you enjoyed you stay with us and look forward to seeing you again sometime in the future. Had a lovely week here, staying with my sister and visiting my dad who lived locally. The house is perfectly situated in town with great views and so close to all the amenities of St Neots. Great for popping out for coffee in the morning, a bit of shopping and then lots of choice of restaurants too. Thank you for taking the time to provide us with a review of River Terrace. We are really glad you enjoyed your stay with us. We look forward to meeting you in person sometime in the future. Excellent accommodation for our family of 4 plus 2 adult friends. The house was very well equipped and the living area very spacious. In a quiet area but only a short walk to the town or the river/park area. Timely communication from the friendly owners. Many thanks for taking the time to provide us with a review of Rover Terrace. We are really glad you enjoyed your time with us. Thank you for leaving the house is a fantastic condition, this really helps us. Hope to see you again sometime in the future. Fleur and Paul were very friendly and welcoming hosts and were available to contact if we had any questions during our stay. On arrival we found they’d provided us with all the basics such as tea, coffee, milk etc. plus some extra treats, cake, wine and flowers. 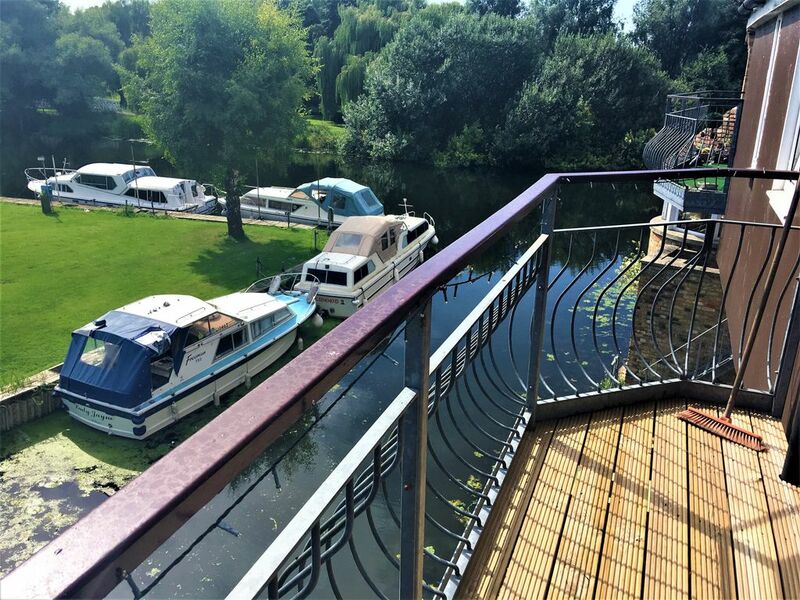 The house was a very comfy and relaxing place to stay with the added bonus of the balcony with seating area, which is an absolute sun trap, with a wonderful view over the river. There are Restaurants, pubs, tea rooms and shops all close by. Would definitely recommend a stay here. Thank you for taking the time to review your stay with us at River Terrace. These review really help prospective guests. Thank you so much for leaving the house is such a wonderful condition this really helps us. We are really glad you enjoyed your stay and you could not have pick a better nine days. The balcony is a sun trap and we look forward to seeing you again sometime in the future. Parking is strictly prohibited on the driveway in front of the property. We have allocated parking in the parking area. Our parking bay is on the right as you enter the parking area and is numbered 38. River Terrace is a mid terraced property and we have elderly neighbors both sides. We ask that all guests respect this at ALL times.